One thousand feet under the ground, extremophile microbes that have not seen the light of day for four million years are giving up some fascinating facts to scientists who go the distance. Geomicrobiologists are scientists interested in life at the crossroads of geology and microbiology. Microbes that live in underground caverns or cave systems offer a rich opportunity for researchers to pursue a variety of research aims. The conditions in which microbial life developed on Earth are far different than the conditions in which humans evolved. Microbes in isolated caves offer scientists the chance to study and analyze bacteria and other microorganisms relatively untouched by humans, or time. Lechuguilla Cave is part of Carlsbad Caverns National Park in New Mexico. The cavern is one of the longest caves in the world, with more than 136 miles of passages, and is currently the deepest known limestone cave in the United States. The cave, a UNESCO World Heritage site, is home to significant deposits of yellow sulfur, rare cave structures, and diverse geologic formations. With its extreme conditions, the cave is also home to extreme bacteria that consume the sulfur, manganese, iron, and other minerals found in the cave. The beauty and scientific wonder of the cave are matched by its fragile nature. Access to the cave is restricted to preserve the environment and ecosystem. 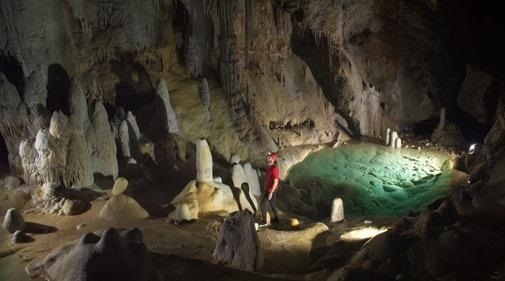 The minerals, earth materials, and microbes that reside in Lechuguilla Cave have not been exposed to the surface of our planet for over four million years. In this otherworldly research setting, scientists from McMaster University in Canada and the University of Akron, Ohio, identified bacteria that display multi-drug resistance — without ever being exposed to antibiotics. In their article published in the journal Nature Communications, study authors describe chemolithotrophic microbes they found in the cave. These specialized microbes survive off of inorganic materials like sulfur, ammonia, and other matter as their food. While it is not unusual to identify extreme bacteria in deep caves, these bacteria were found to have something else as well. The bacteria examined in this study, named Paenibacillus, are naturally resistant to many drugs to which they have never been exposed, including one drug considered a "drug of last resort" by the current medical community. Scientists used genome sequencing and functional genomics to analyze the genetic background of the bacteria. Functional genomics is a process used to parse, compare, categorize and utilize data gained through the sequencing process. "The diversity of antibiotic resistance and its prevalence in microbes across the globe should be humbling to everyone who uses these lifesaving drugs," remarked Gerry Wright, a study author and scientific director of McMaster's Michael G. DeGroote Institute for Infectious Disease Research, in a press release. Paenibacillus bacteria are resistant to many of the antibiotics currently in use, including drugs used against severe human infections. The processes the cave bacteria use to defend against antibiotic compounds is the same mechanism used by common microbes found in the surface soil of the earth. While surface soil has been plentifully exposed to antibiotic compounds through agricultural and other use, the cave bacteria have been isolated. This interesting comparison points to sustained mechanisms of resistance harbored by bacteria over millions of years — not just since antibiotics were developed, or overused. Additionally, researchers identified five new "pathways" that some bacteria may use to become drug resistant. Understanding these avenues could give medical science advance warning of potential forms of antibiotic resistance before they become a danger to the human community. "Exploring these challenging and remote environments offers a unique opportunity to sample the genetic diversity of microbes untouched by human activity," Hazel Barton, professor and director of Integrative Bioscience at The University of Akron, noted in the same press release. These bacteria have never see the light of day, yet these findings might make the future a little brighter for humans. By boosting our understanding of drug-resistant bacteria, we might be better able to navigate — or avoid — future types of resistance in dangerous pathogens.